Hot off the press from 35,000 feet: Here are my carry on essentials for surviving long haul flights. Does the thought of a sixteen hour nonstop flight make you cringe? Fear not! I’ve got some great tips and tricks for surviving long haul flights. These 10 carry on essentials will help you fly in comfort, and will also keep you feeling fresh. Safety first! Since you’ll be sitting in the same spot for hours on end, it is important to keep your blood flow properly circulating. To prevent some rather serious health conditions (such as DVT) you can wear compression socks. They improve blood flow and other circulation problems, and prevent pain and swelling in the legs. I suffer from restless leg syndrome and compression socks give me a much more comfortable flight. My favorite brand are the colorful and fun Newzill socks! This simple little contraption is a life saver and may be the best $15 you’ll ever spend! 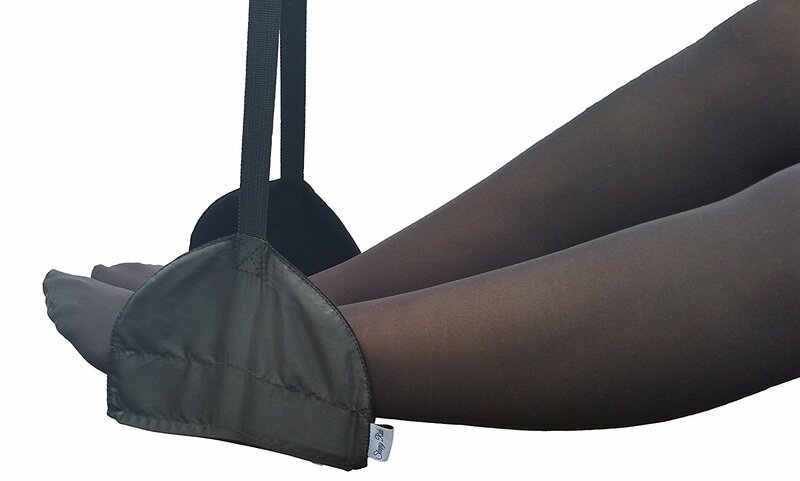 It hangs over the tray table of the seat in front of you, allowing you to elevate and stretch your legs. I’m always surprised when no one else is using one of these on a long haul flight. It is also really helpful for people with restless leg syndrome. My favorite brand is Sleepy Ride because it is adjustable and made with a soft memory foam. 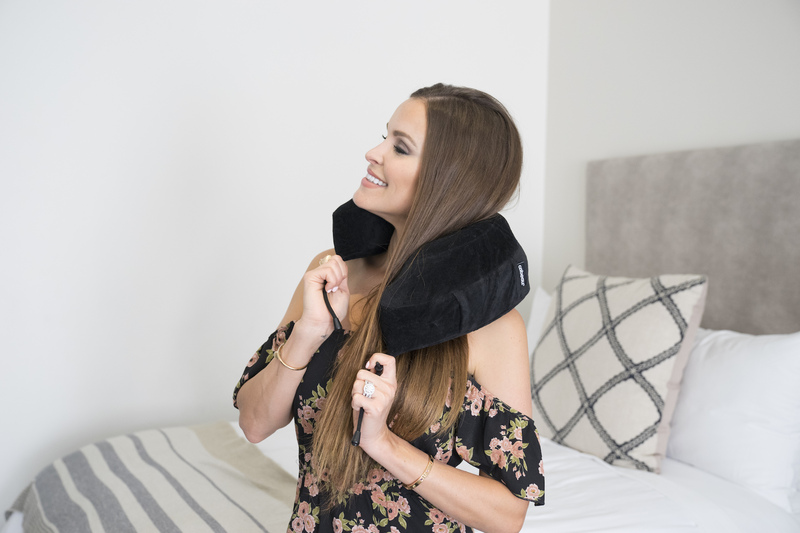 Neck pillow… duh… this one is a given! But there are many different kinds of neck pillows and I find that the best brand is the Cabeau Evolution Pillow. It comes with a travel bag that keeps it from coming into direct contact with all of those nasty airport germs. It has a velour cover and is nice and squishy and rolls up into a small ball that Velcros right onto your suitcase. Plus it comes with earplugs! In order to keep all of this stuff organized, I recommend using bag organizers like these ones from Porte Play. On airplanes, there’s no space to be fumbling around in your bag searching for things. If everything is organized into smaller compartments, life at 35,000 feet is lot more convenient, and you don’t have to worry about elbowing your neighbor. There is nothing more uncomfortable than trying to sleep in an airplane seat in jeans that are cutting off your circulation. 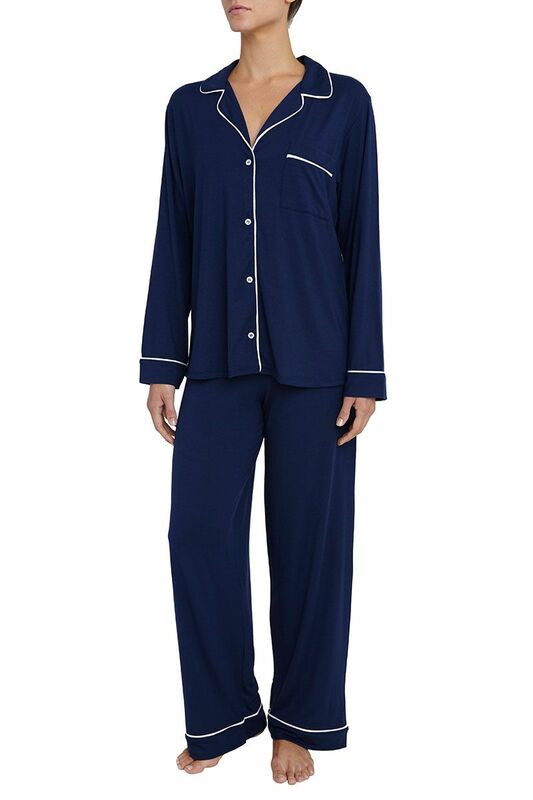 I always bring a pair of soft comfy modal pajamas, like these from Eberjey, to ensure I’m able to get my sleep. This also keeps your clothing from getting soiled so that when you land you feel a bit fresher than everyone else. And fear not, when they turn out the lights on the plane, no one will be able to tell that you’re wearing pajamas. Let’s face it, lots of unpleasant smells circulate the airplane. None of us like to marinate in them, and then land in a new country smelling of filth. It’s always a good idea to bring a travel-sized perfume, like Christian Siriano Silhouette from The Fragrance Group, to keep yourself smelling fresh. I like this one because it rolls on, so I don’t have to worry about spraying it with so many people around me. The dryness that occurs on long haul flights is the worst! Be prepared with a good chapstick, hand lotion, and facial moisturizer. My favorite brand for flights is Kiehl’s because it is deeply hydrating without leaving an oily finish. This one is really important for feeling fresh when you land. Always keep a spare pair of underwear in your bag. Who wants to wear the same undergarments for 24 hours straight? My favorite brand for women is Hanky Panky because they are breathable and do not cut into your skin, allowing for a more comfortable flight. Don’t wear shoes that are hard to put on and take off! Being able to easily slip off your shoes and let your little piggies breathe makes life a lot more comfortable. And whatever you do, do not walk around barefoot! People track around all sorts of nasty stuff from the bathroom floors! Be sanitary yet comfy in a simple pair of sandals or slippers. Airplanes and airports. Enough said. Sanitize your hands and stop the spread of all those filthy germs with sanitizing hand wipes. 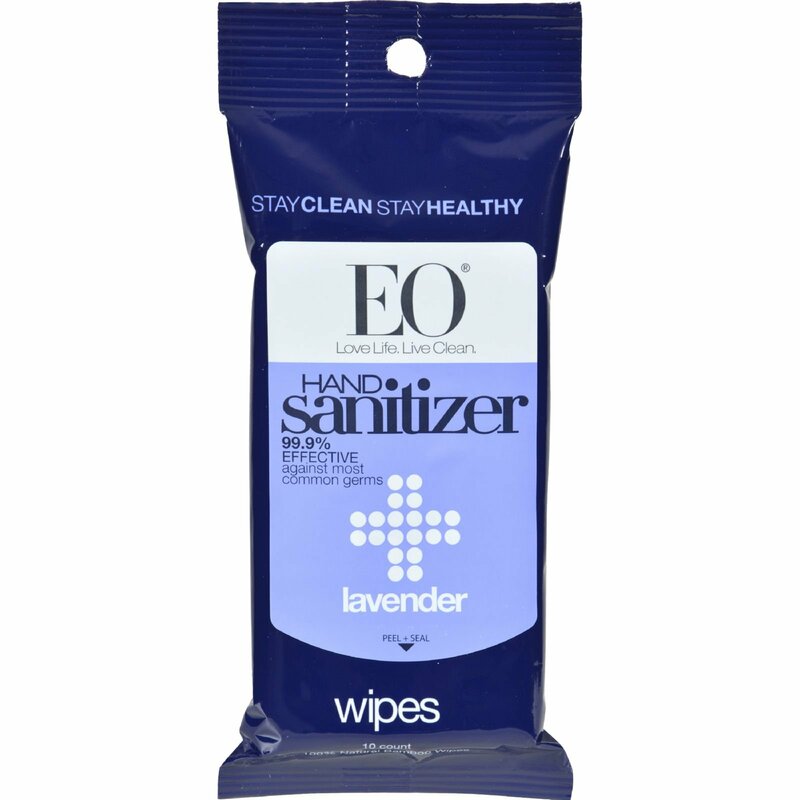 My favorite brand is the lavender scented EO wipes – not only because I love the scent, but because they use an all-natural disinfectant. We don’t sleep with make up on while at home, why would we want to do it on flights? Facial cleansing make up remover wipes will not only help you feel clean, but they’ll also allow you to add a fresh face of make up before you land. I’m also a fan of the EO Make-Up Removing Wipes. This is a sponsored post, but the opinions expressed in this article are, as always, my own.